There’s a misleading statement on chicagopedsafety.org. The large headline states, “Drivers must stop for pedestrians entering a crosswalk. It’s the law.” The image above shows the marketing piece taken directly from their website (scaled down 50%). For this blog post, I added the actual law from the Illinois Vehicle Code below their banner. (b) No pedestrian shall suddenly leave a curb or other place of safety and walk or run into the path of a moving vehicle which is so close as to constitute an immediate hazard. I posted about this law a couple years ago. Note item (b) above. It specifically states that pedestrians are NOT to ENTER the crosswalk when a vehicle is approaching so close as to constitute an immediate hazard. The key word here is “ENTER”. It is irresponsible to entitle pedestrians with the unlawful notion that drivers are required to stop for pedestrians ENTERING a crosswalk when the law specifically states the opposite. I completely support pedestrian safety. It’s absolutely terrible that drivers neglect their lawful responsibilities by endangering, hurting, and even killing innocent pedestrians. I applaud the city of Chicago for rolling out this campaign to build pedestrian safety awareness. The key here is safety. The message needs to assure safety, not misled trust or confusion. However, it is incredibly harmful when the city sends wrongful messages to its citizenry. The law states that pedestrians may not enter the crosswalk when I am driving my vehicle in their proximity which would result in immediate hazard. The message the city is sending tells us specifically that it’s “the law” that we can enter a crosswalk at any time because no matter what drivers are required to stop. That is a dangerous contradiction. I certainly do not want to hit someone who thinks they are entitled to begin entering the crosswalk when me and my car are within close proximity. They will assume they have the right to enter that crosswalk when the law states otherwise. Yes, I will do my best to avoid hitting them. But I don’t want pedestrians to be entitled by statements from the Chicago Ped Safety campaign to own the road regardless of proper law, and create dangerous situations that could have been avoided. 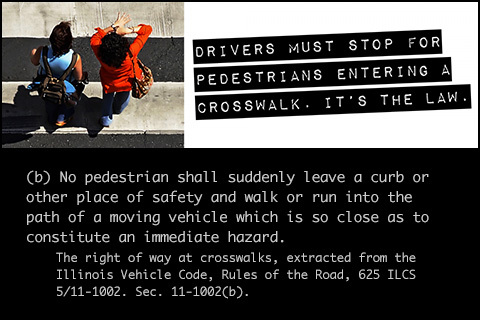 If the State of Illinois wants to amend the law to say that pedestrians have the right of way to enter a crosswalk regardless of approaching vehicles and their distance, then fine. In that situation I will alter the way I drive. Any time I see a person any where near a crosswalk, I will stop my vehicle and wait to see if they cross. I might even have to roll down my window and ask if they plan on entering the crosswalk. I don’t want the risk of potentially hurting them because the law says they can go in the crosswalk regardless of my car’s location. I would HAVE TO stop because I don’t know if that person standing on the sidewalk is going to decide to enter the crosswalk. I can’t read their mind. The Chicago Ped Safety campaign needs to review the Illinois Vehicle Code before it broadcasts a campaign to the public with potentially harmful and unsafe messages.